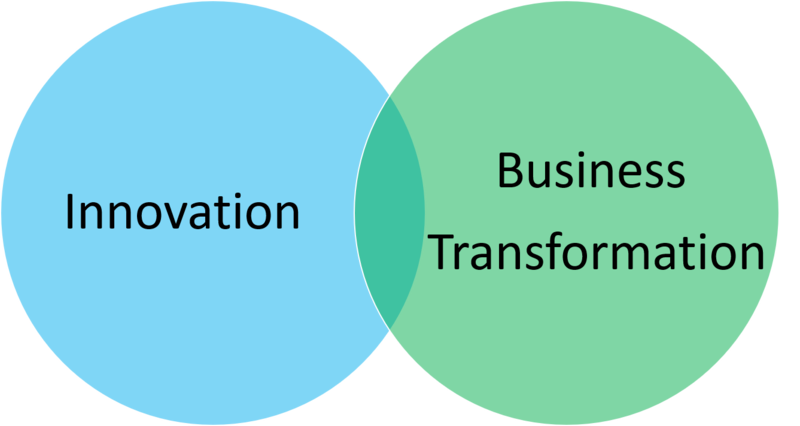 An interesting debate transpired during the last #CIOChat on Thursday at 2pm around Myles Suer's question, "How is #innovation fundamentally different from business transformation?" I had significant feedback to my tweets and decided to dedicate this week's blog post to detail my perspective. Allow me to expand on these notions. Let's look at some definitions. 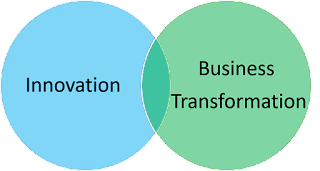 Now I would argue that business transformation also includes changing the business model, products, and services, but some might argue that this is business model transformation. There's also digital transformation, which has some wildly different definitions, but I still stick to the one I wrote in 2015 on What is Digital Business and Digital Transformation. Innovation is about something new whereas transformation is around a fundamental change. Something new has to be evaluated outside-in. An organization's customers or suppliers are the best input on whether something the organization has done is truly new. Alternatively, the media is also a judge of whether something is truly new, but one might argue that some in media have very high standards for something new while others have very low standards. A fundamental change on the other hand is more often viewed from the inside. Is your vision going to fundamentally change systems, processes, people and technology? Is your digital transformation program going to fundamentally change what you are selling to customers, how you are interacting within your business' ecosystem, or how you are gaining a competitive edge through the application of digital processes, technology, and analytics? By these definitions, some things an organization may be innovative (ie, new) but not transformative. The vice versa is also true, that an organization may be driving a transformation that fundamentally changes its operating model has no or few innovation qualities. Let me now share some examples and my viewpoints on whether they are innovative, transformative or both. The Amazon Alexa is innovative but not transformative - When the Alexa came out, it was truly something "new". It was the intersection between a bluetooth speaker and voice recognition system that channelled interactivity through skill cartridges. Consumers could now dictate shopping lists, request music by voice command, turn on or off lights, request the news and weather and many other applications. From the outside-in, this was something new. But did the Alexa fundamentally change Amazon's business? Was there a fundamental change in how they were operating? I would suggest no, or at least not yet. Microsoft transformed from Windows licensing to Azure cloud subscriptions, but was this innovative? - There's no doubt that Satya Nadella's shift from a desktop, licensing based Windows business to Azure that is now the number two public cloud was a significant business transformation. It fundamentally changed the architecture and delivery model of its technology. It changed how Microsoft sells and markets its capabilities. But is Azure innovative? Certainly some services that Azure offers and its delivery approach may be new approaches, but Azure was second to market and in many ways is still catching up to Amazon Web Services. Overall it's not new - at least not yet - and that's ok! It's ok to deliver a fundamentally changed offering to customers even if it isn't new or innovative! Apple's iPhone is probably the best example of innovation and transformation - At the time, the combination of a computing device, a media device, and a communication device all in one was a new innovation. It was a new way for consumers and business people to get access to information without being tethered to their desktops. It was an innovation that continue to evolve with the app store, new photo capabilities, new location based services, etc. It also fundamentally changed everything about how Apple operated. It was no longer a niche computing device and platform; it fundamentally changed and became a dominant standard for compute, media, mobile worklflows, and other capabilities. Some may debate the categories that I assigned to Alexa, Azure, and the iPhone. That's ok. Find others. Is your new mobile app innovative, transformative, both or neither? How about the self-service BI tools you are rolling out to the organization, the RPAs that will significantly reduce costs and improve quality, or the IoT and AI enabled manufacturing system that's connected to your supply chain network? The point really is that business must transform to be competitive, but that doesn't mean they need to be innovative.